Army Chief Gen. Bipin Rawat is likely to visit the northeastern region in the next few days to take stock of the operational matters. The visit is taking place in the backdrop of the standoff between Indian troops and Chinese army in the Sikkim sector and China's allegation that the Indian forces trespassed into its territory. 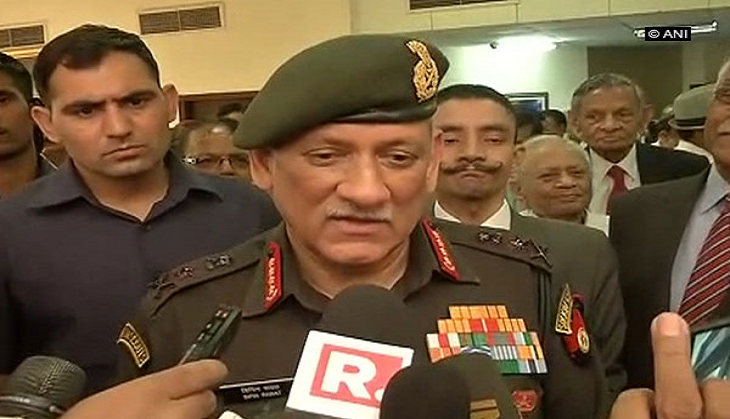 Official sources, however, said Gen. Rawat's visit to various formation headquarters will be a routine one and it is a pre-scheduled trip. "The Army chief is likely to visit the northeastern region as part of a routine tour," a source said. Gen. Rawat will review various operational matters in the Northeast -- a strategically key region having most of the 3,488-km-long-border with China. Tension mounted in a remote area of Sikkim following a scuffle between the personnel of the Indian Army and the PLA, leading to Chinese troops damaging bunkers on the Indian side of the border earlier this month. Today China accused Indian troops of "crossing the boundary" in the Sikkim section and demanded their immediate withdrawal, while asserting that it has shut down the Nathu La pass entry for Indian pilgrims travelling to Kailash Mansarovar because of the border standoff. China also said that it has lodged diplomatic protests with India, both in New Delhi and Beijing, alleging that the Indian troops trespassed into Chinese territory in the Sikkim sector. The Indian Army has not commented on the face-off. Chinese defence ministry spokesman Ren Guoqiang said yesterday that recently China has begun the construction of a road in Donglang region, but was stopped by Indian troops crossing the Line of Actual Control (LAC).